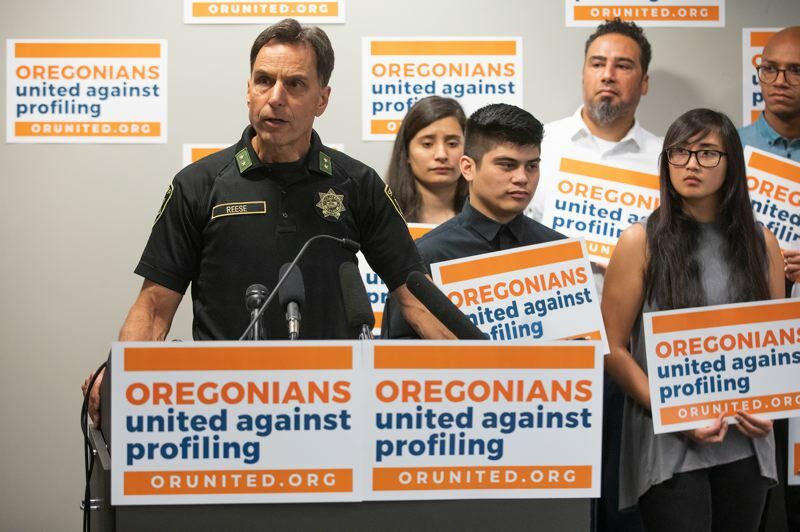 Oregonians United Against Profiling - a coalition of business, labor, immigrant rights group and law enforcement - argue that the state's 30-year-old sanctuary law helps reduce racial profiling and protects civil rights. PORTLAND — Law enforcement and business representatives on Monday announced their opposition to an initiative petition to repeal the statewide sanctuary law. Multnomah County Sheriff Mike Reese said the law prohibiting the use of state and local resources to enforce federal immigration law has worked well since it was passed more than 30 years ago. "Our current law allows police agencies to appropriately share information with our federal partners when a crime occurs. It creates clear guidelines to help local law enforcement navigate the complicated immigration strategies and policies at the federal level," Reese said. "It keeps our local police focused on solving crimes by letting victims and witnesses know that they can report crime to us without fear of their immigration status. It also ensures our deputy sheriffs and police officers don't become embroiled in the politics of immigration enforcement." The law applies only when a person's only crime is being in the country illegally. Reese appeared with Sandra McDonough of Portland Business Alliance Monday at the Northwest Health Foundation in Northwest Portland to explain why they oppose Initiative Petition 22. 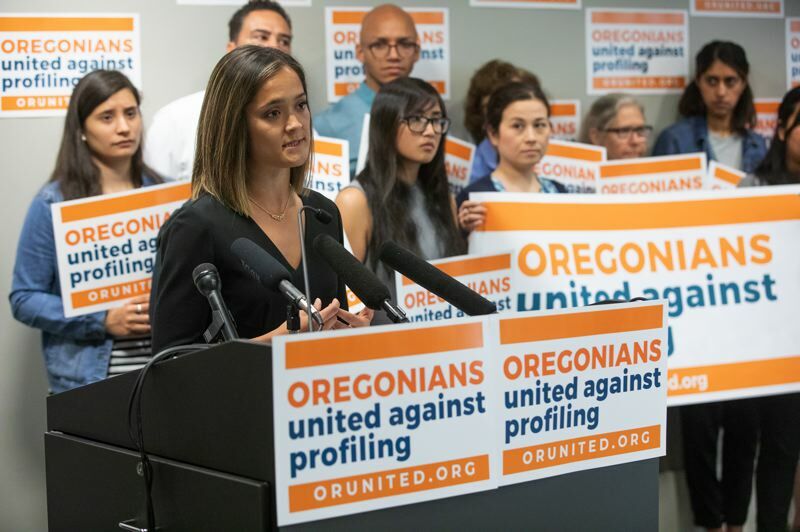 The appearance was one of five events held around the state to mark the beginning of the campaign against the repeal, Oregonians United Against Profiling. More than 80 businesses, labor organizations, faith and civil rights groups and law enforcement leaders have joined the coalition against IP 22. Other law enforcement, including Deschutes County District Attorney John Hummel, also have expressed support for the sanctuary law. On a national level, the International Association of Chiefs of Police and other policing organizations have opposed involving local law enforcement in federal immigration enforcement. The Oregonians United Against Profiling campaign against IP 22 earned that name from the history of the sanctuary law, said Andrea Williams, executive director of Causa, a statewide immigrant rights organization. "At that time, Oregonians, including U.S. citizens, were being harassed by local police demanding to see their papers, and people were afraid to go to the police for help," Williams said. Oregon lawmakers passed the sanctuary law in 1987 in response to widespread racial profiling of immigrants. In one high-profile case in 1977, Delmiro Trevino, a U.S. citizen of Mexican descent, was arrested at a restaurant in Independence because police suspected that he was undocumented. He later filed a class action suit, and his lawyer, Rocky Barilla, went on to win election in 1986 as a state representative – becoming the first Latino elected to that position in the state's history. He introduced the legislation that established the sanctuary law, winning support from both Democrats and Republicans. "The most important job for local police is solving local crimes and keeping communities safe," Williams said. "Police need the trust of the community to do their jobs." Cynthia Kendoll, president of Oregonians for Immigration Reform, who helped organize signature gathering for IP 22, was not immediately available for comment. But Kendoll has said in the past that part of the goal of the initiative is to prevent undocumented immigrants from using local services intended for Oregonians. IP 22 appears likely to land on the Nov. 6 statewide ballot after sponsors turned in more than 110,000 signatures to the Secretary of State's Office uly 6. The Secretary of State's Office is in the process of verifying the signatures, with a deadline of Aug. 6 to complete the task. Meanwhile, the Oregon Department of Justice is investigating allegations that voters were tricked into the signing the petition, said DOJ spokeswoman Kristina Edmunson. The same complaint was filed by several voters, said Debra Royal, chief of staff for Secretary of State Dennis Richardson. Royal said she didn't immediately have an exact number of complainants. Earlier this year, the U.S. Department of Justice threatened to deprive sanctuary states of federal law enforcement grants. Gov. Kate Brown's office said Monday that officials have not received any recent communication from the justice department on that matter.